Combining the softness, warmth, and feel of wool with the easy care of acrylic, this 4-ply, worsted-weight yarn is beloved by knitters and crocheters for its versatility and value. 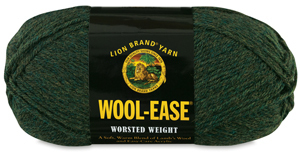 Lion Brand Wool-Ease Yarn is offered in an extensive range of colors, blends, and even prints. ® Lion Brand Yarn is a registered trademark.® Wool-Ease is a registered trademark.